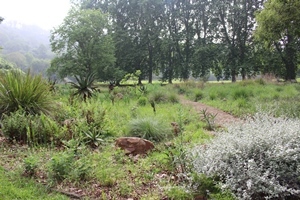 The establishment of a botanical garden in Pietermaritzburg in 1874 was in response to a growing demand for tree seedlings in the Natal midlands. Many of the ‘Grand Old Trees’ date back to this period, when the lower part of the Garden was laid out in geometric form with blocks of tightly packed trees. 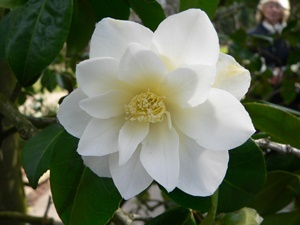 By the 1900s the Garden had removed many of the trees and established paths, a rockery and prize collections of azaleas, as well as a pond and tea garden. 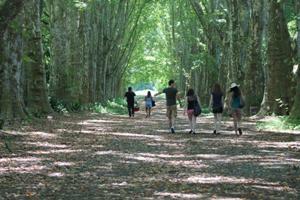 Camellia Walk was laid out in 1908 and Plane Tree Avenue was planted in 1908 by curator Brian Marriot in response to a suggestion from the Governor of Natal. 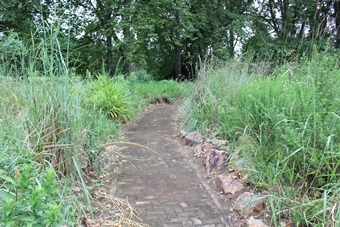 In the 1970s the formal paths were removed to make way for a more informal display garden. 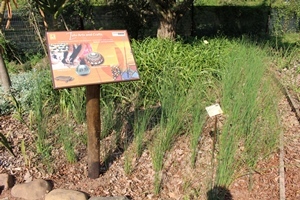 The Useful Plants Garden displays a wide range of indigenous plants traditionally used for healing, charms, crafts, building and food and drink. 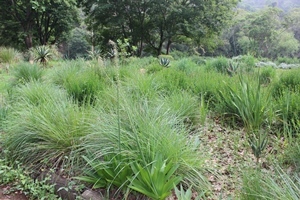 The Grassland Bed comprises grasses and associated plants from the summer rainfall grasslands which are grown in a ‘naturalistic’ way. 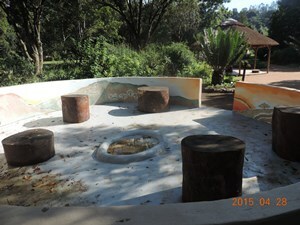 The ‘look-listen-feel-smell’ garden was designed to stimulate the senses of both young and old alike. Illustrated on this section of the map is the blue water lily (Nymphaea nouchali) and the Hilton daisy (Gerbera aurantiaca). 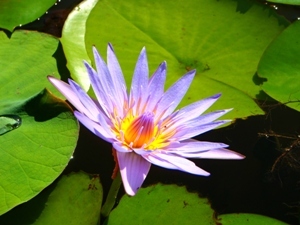 The blue water lily is found in rivers, lakes and ponds throughout Africa. These beautiful blue- and pink-flowered water plants are used in traditional medicine. The beautiful red Hilton daisy is only found in the KwaZulu-Natal and Mpumalanga mist belt regions. It is endangered due to habitat transformation by commercial forestry and agriculture. 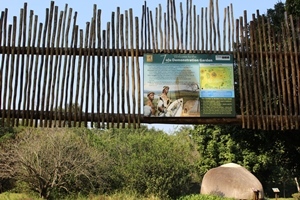 The Hilton daisy is the flagship species of the KwaZulu-Natal National Botanical Garden’s Threatened Species Programme. 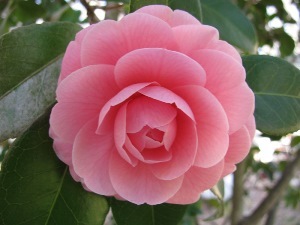 The most famous visitor to this section was President Paul Kruger, who planted a Camellia japonica in April 1891. 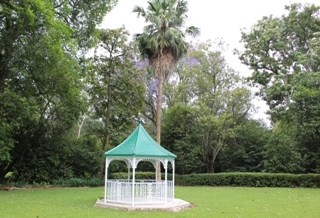 From 1892 onwards the Garden provided flowers for exhibition at shows. 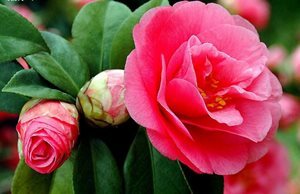 Because of the beautiful flowers in this garden, and an attractive fragrance from surrounding Jasminum and Osmanthus fragrans inside this garden, and the azaleas forming a front hedge with a show of flowers of various colours, the pathway in between has been declared “The Lovers Lane”. 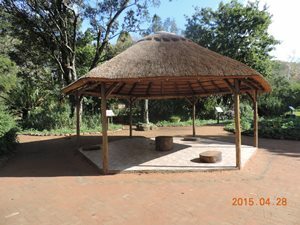 The latest addition to this area is a gazebo for a Wedding Garden.For more information about the Wedding Garden please contact Bathabile Ndlovu (Wedding Garden Project Manager) on +27 (0)33 344 3585. 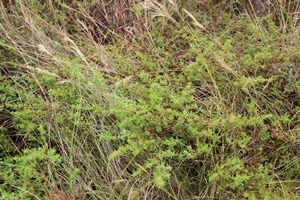 The Zulu Pharmacy – Plants used in traditional medicine, health and beauty.These useful plants have various culinary, medicinal and cultural uses. Some plants treat headaches, snakebites etc. 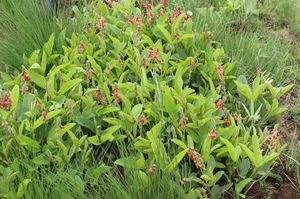 Over a thousand different plants are used in Zulu culture for medicinal purposes alone. 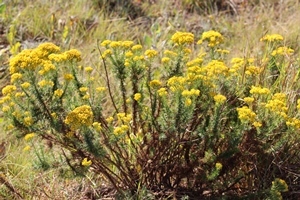 Many of these plants are becoming threatened due to over-harvesting of wild populations. 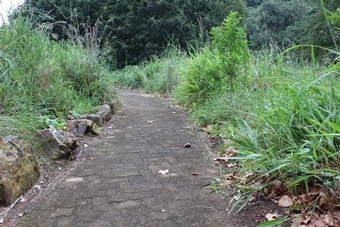 This exciting garden aims to broaden public awareness on the importance and value of our useful plants. Bartering was a trading method used to share all sorts of crops and ensure that everyone had food. 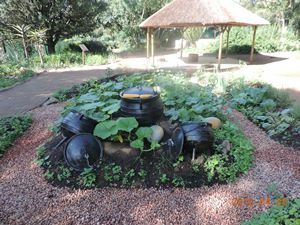 This section aims to educate the public about getting back to basics and producing their own food.This garden also teaches visitors about rituals, ceremonies, songs and music, dances, storytelling and clothing associated with Zulu culture. 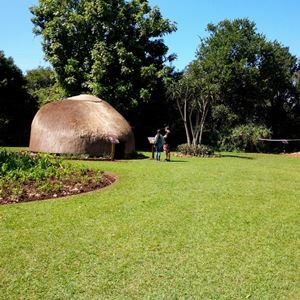 Gain insight into how the oral tradition of Zulu storytelling and use of lore, proverb helps consecutive Zulu generations in understanding and interpreting the natural world of plants and animals. 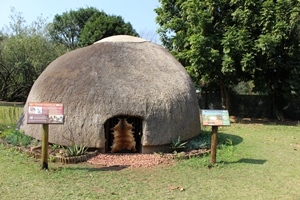 Look at displays of cultural weapons, woven baskets, mats, clay pots, utensils, bead work and musical instruments inside the traditional beehive hut.To book cultural tours and other cultural events please contact Mbuso Zondi (Interpretation Officer) or Siphu Ngqasa (Marketing Officer) on +27 (0)33 344 3585.
vernonias, senecios, helichrysums and various bulbs form lovely colourful displays. Some species found in this section are very rare and some have limited distribution countrywide.Take a glance and discover the hidden treasures of this grassland, and be amazed by the herbaceous layer with its beautiful flowers.